Last night I got home at 10 pm (est) to find my pregnant wife fast asleep in bed, so I opened up the computer and got to watch the final 3 innings of the Giants beat down (finally) of the dreaded Marlins. I turned the game on in time to watch Melky Cabrera rifle a 2-RBI double down the left field line. The Marlins commentators then launched into talking about how good Melky has been, and what a surprise he is given how bad he was in New York. It hit me: this trade is eerily reminiscent of when Sabean brought Jeff Kent over, way back in 1997. Then this morning I see this. Scooped! Dang. I’m going to talk about it anyway. Cabrera for Sanchez did not produce the public outcry of Williams for Kent. But, I would say most Giants fans weren’t in favor of the trade. No one saw the Williams trade coming, and it looked this Giants were going backwards. The big difference with Cabrera is that Giants fans had been expecting a Sanchez trade for a long time. So long in fact, our imaginations got out of control: Sanchez for Votto…Sanchez for Wright…Sanchez for______(insert up and coming hitting star here). When that blank ended up being filled in with Melky Cabrera there was a collective “really, that’s it” groan from the Bay Area. Kent had a couple of decent years (his “struggle” years are so far beyond the production the Giants are getting from 2B right now it’s really not funny), but had been widely panned as a disappointment for the Mets. A similar situation unfolded for Melky with that other NY team, followed by a very disappointing season in Atlanta (take note Brandon Belt apologists, Melky’s horrible season for the Braves came at age 25, a year ahead of Belt and with four full seasons of big league ball under his “belt”…stay patient). The real point I want to get at here is that GM Brian Sabean takes his lumps for sure. I think he is terrible at signing free agents, and I think the organization as a whole (not sure how much blame to put on Sabes for this) is shoddy at position player development. But I think Sabean is one of the best trading GMs in baseball. He has made one spectacularly horrible trade (don’t even need to mention who was involved), but on the whole he’s done well. Giants’ fans need to get over the fantasy trade scenarios with Jonathan Sanchez…maybe there was a time when he could have fetched something really remarkable. But maybe that never existed. And, let’s be honest, Melky’s been pretty remarkable. So has Pagan. And those extensions to Cain and MadBum and Vogelsong look pretty good. And that non-extension to Lincecum…maybe the best move of the offseason. Brian Sabean, you’ve taken plenty of heat, but here’s a tip of the cap. This offseason, which seemed so boring, was pretty awesome. By all accounts it was a horrible week for the Giants: Pablo Sandoval to the DL, a sweep at the hands of Marlins, 4 loses in a row, another bad Lincecum start, a bad Zito start, more injuries, slumps…I could go on. Somehow, in the middle of all that, the Giants are .500, 4 games out of first, in second place, and facing a 3 game series against the Dodgers with a chance to cut that lead down. It’s not all roses and puppies, but it could be worse. That said, losing 3, 1-run, games in a row to the Marlins hurts. Really not good. Painfully reminiscent of last season. Let’s not do that again. As if to mock us, Pablo Sandoval had the best average (.400) and only home run of the last week. So glad I just looked that up. Outside of that Angel Pagan and Melky Cabrera had great weeks (collectively hitting .345). They both leave something to be desired (Pagan never walks), but so far the two big off-season moves (trades) are paying off. Melky, in particular, has impressed. (As I write this Jonathan Sanchez just gave up another run, 7 now, to the Red Sox). All Matt Cain did this week was pitch 15 innings, strike out 14 batters, give up 14 baserunners (0.93 WHIP), and 4 earned runs (2.40 ERA). What does he have to show for it? An 0-1 record. I am not an apologist for the statistic of wins. But it really ticks me off when east coasters scratch their heads and laugh at the Giants for giving Cain the largest contract in baseball history for a right-handed pitcher. The dude’s good. Don’t look at his record. His win/loss record might be the greatest example of sports injustice known to man. Huge series with the Dodgers, obviously. Despite my positive spin earlier, the Giants are not set up well in this series with their two best pitchers (Cain, MadBum) being the only two guys who won’t start in LA. Instead we get Zito, Vogelsong, Lincecum. And the Dodgers have their three best guys going (Lilly, Kershaw, Billingsley). Not excited about that. Here’s to hoping they can find a way to pull 2 out of 3 out of a hat. After that, back to Arizona for three more (didn’t we already go there?). Get it together quick boys! I know it’s early and all lot of this is small sample size, but let’s take a look at the early happy things and early sad face things about the Giants this young baseball season. Melkey Cabrera: I admit, I hated the trade when it happened, not because of trading Jonathan Sanchez, but because I thought the Giants could have gotten a lot more for him than a guy who I saw in Atlanta as mediocre at best, however I like what I see so far this season. He could easily slide back into mediocrity, but for now he’s one of the Giants most consistent hitters, and I approve of that. Brandon Crawford: Huh? I know he’s not exactly setting the world on fire with his bat, but I’m really enjoying watching him play. He looks more relaxed than last season, I love his glove and I like what I see with him at the plate. Won’t be a great hitter, but I look forward to seeing his development more this year. Homegrown talent: For too long the Giants homegrown talent has been all pitching, but a few times this year we’ve seen an infield of Pablo Sandoval, Manny Burris, Crawford and Brandon Belt, with Hector Sanchez in the game as well, all Giant draft picks. They all aren’t the hitting equivalent of Lincecum or Cain, but it’s nice to see that between these guys, and players like Gary Brown and Joe Panik in the minors, the hitting part of the Giants future is looking nice. Pablo! Yes, he put on a little more weight, but he’s still hitting well and fielding well and is there a more fun Giant to watch? I don’t think so, and in addition to all of that, he’s our most consistent hitter! Yay! Starting Pitching: Bad first starts, amazing second starts from Cain and Bumgarner, good two starts for Zito and a good start from Vogelsong. Now get your head in the game Timmy! Angel Pagan: At least he’s healthy while Torres is on the DL, but the guy looks lost at the plate. Sure he’s fast and can play CF, but so can Gregor Blanco and that guy had an amazing spring. Second Base: Freddy Sanchez on the DL, and is probably on his last legs, Manny Burris and Ryan Theriot are the other options and both don’t provide much to this club. Thankfully Joe Panik looks like our future second baseman, but he’s probably 2, more likely 3 years away, what do you do in the meantime? Brian Wilson: Out for the season it looks like, and who knows if he’ll ever pitch for the Giants again. I love, LOVE Wilson, but his velocity is down, his strikeouts are down, he looks like he’s really struggling out there and now another arm injury. I hate to say it but his time might be coming to an end in the Black and Orange. Tim Lincecum: I don’t think anything is wrong with him and I’m confident he’ll put it together, but he’s getting lots of money and is due for lots more in a few years. I really, REALLY hope this isn’t the beginning of a downward spiral into middle rotation status, but he needs to start showing some more velocity and control out there. So I’ll be honest, I originally planned on writing this post a few days ago when the Giants/Royals trade occurred and my response was how awful a trade it was. I hated it, thought it was a stereotypical stupid Sabean trade and that was that. However as the days have passed and I’ve had time to process my feelings have changed, not a lot mind you, but some. I still don’t like the trade overall but I don’t think it’s quite as bad as I thought at first. First of all we have Melky, as average of a ballplayer as you can get. I had a friend ask me if anyone who starts for the Yankees could truly be considered average, and the answer is yes and his name was Melky Cabrera. His stats through 5 seasons and a little over 2100 at bats as a Yankee were 90 doubles, 12 triples, 36 HR’s, 228 RBI, 44 Stolen bases, 171 walks, 246 K’s and a .269/.331/.335 line, in other words, nothing exciting or outstanding at all. Add to that a terrible season in Atlanta and a career year in KC where he hit half of the amount of HR’s he hit in his whole 5 seasons in New York and I’m not excited, at least not for the price it cost, and there is the real issue with this trade. Melky is a fine addition to the Giants and a much better option than someone like Coco Crisp or David DeJesus, but for what the Giants gave up, we should have gotten more. Now before anyone says it, yes, Jonathan Sanchez is no more than an above average pitcher, a good 3rd or 4th starter option for almost any team in the league. His career stats in 6 seasons with the Giants are a 38-46 record with a 4.26 ERA and 376 walks. However he also has 736 strikeouts and he’s a lefty, which by nature means he has more value than an identical righty. Do I think it was a good idea to trade Sanchez? I do, in fact I said so in a post shortly after the regular season ended, and trading him for a bat brings more value than DFA’ing him or trading him for another arm, but Jonathan Sanchez is still a valuable pitcher who should have brought more value in than an average outfielder that management doesn’t yet know how to fit in the lineup. Now I know real life baseball is not like a video game where you can propose any trade and it works out for your team 99% of the time, and if this is what the market thought Sanchez was worth, than that is what he’s worth, but it’s hard for me to see how this pitcher wouldn’t be more coveted in a league where pitching is valued so much. I didn’t expect to get an all-star for Sanchez, but it feels like Sabean took the first offer given to him rather than wait for the market to develop (the Red Sox, for instance, didn’t even know he was on the market). 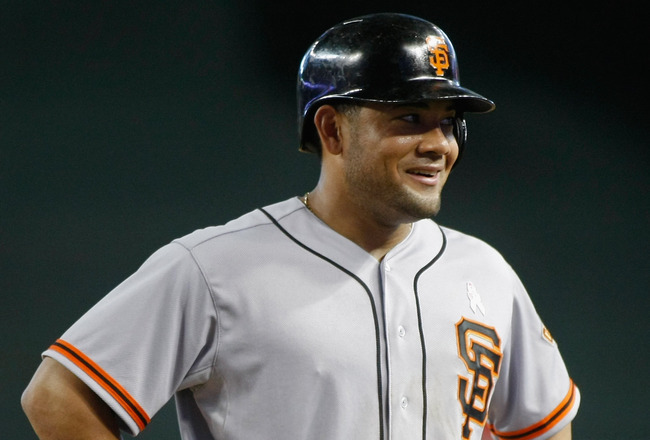 Will Melky help the Giants next year? I hope so, but it’s not like he’s a power hitter. We need to resign Beltran and get another veteran infielder and maybe a 5th starter, but a solid bat HAS to be our priority this offseason, and Melky just isn’t that.